1. It takes years to straighten teeth. You might be able to enjoy straighter teeth sooner than you think. 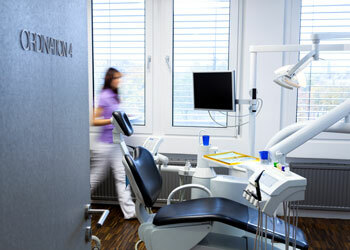 The timeframe of your treatment will depend on how much your orthodontist needs to move your teeth and jaws. Whether you get metal braces or clear aligners, your orthodontist will carefully plan and monitor treatment to safely move teeth. How long it takes to move teeth can also depend on your compliance. For example, Invisalign aligners need to be worn 20 to 22 hours a day in order to work. 2. Only metal braces can straighten teeth. Wish you could straighten teeth without braces? Ask your orthodontist about Invisalign. Like the name suggests, Invisalign are nearly invisible aligners that move your teeth little by little into perfect alignment. Since Invisalign braces fit over your teeth, you’ll need to remove them to brush your teeth and eat. However, you’ll need to wear these aligners 20 to 22 hours a day to move teeth according to plan. 3. Only children and teenagers can get orthodontics. It’s never too late to straighten your teeth. More and more adults are discovering the benefits of orthodontics. If you think you would feel self-conscious with adult braces, we also offer clear aligners. Many of our patients appreciate teeth aligners because they are subtle enough to go unnoticed by family, friends, and co-workers. Ceramic braces are also more subtle than traditional metal braces. 4. Braces only change your appearance. Crowded teeth are more than just a cosmetic issue—they affect oral health. Cavities and gum disease are both caused by untreated plaque buildup, which is more likely to happen between teeth that are difficult to floss. Even brushing your teeth can be difficult when you have overlapping teeth. Thankfully, braces and Invisalign move teeth so it’ll be easier to practice good oral hygiene. Unresolved bite issues can cause jaw pain in the long term. If you feel pain when you bite down, you’ll want to schedule an appointment with your orthodontist as soon as possible. For example, overbite correction helps you avoid pain or difficulty while biting, chewing, or talking. 5. I can straighten teeth safely without an orthodontist. The most dangerous myth about orthodontics is that you can safely move teeth without a dentist or orthodontist. The truth is that using a DIY kit off the internet could permanently damage your smile. The safest way to move teeth is to see an orthodontist for treatment. We’ll make sure your teeth are safely moved into optimal alignment so you can smile with confidence. Our team at Armbrecht & Wierenga Orthodontics is dedicated to helping you achieve your best smile through braces, clear aligners, and other orthodontic treatment. To schedule an appointment with one of our orthodontists in Grandville or Kentwood, call (616) 455-4800.